Here is a light snack for when you don't want something too heavy to eat. Light does not mean lack of flavour. 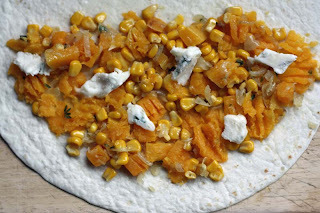 These tortilla wraps were sweet from both the butternut squash and sweet corn, but not overly sweet as they were toned down by the optional creamy blue cheese. MethodHeat the olive oil in a large frying pan over a moderate heat, add the onion and cool for 8 – 10 minutes until soft, then add in squash and sweet corn and cook further until just tender when pierced with a knife. Remove to a bowl, add the thyme and optional cheese and lightly mash with a fork. Season to taste and leave to cool. Place the tortillas on a flat surface, fill the centre of each with the mixture, then fold each tortilla in half over the filling to make a semi circle. Brush the tops lightly with olive oil. Place on a preheated hot grill pan and grill for about 2 – 3 minutes until golden brown. 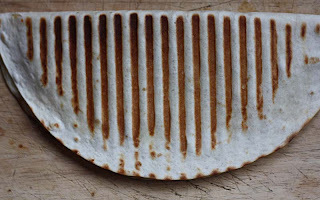 Brush with olive oil, turn over and grill on the other side OR if you have one, make these tortilla wraps in your Panini press for about 5 minutes. Serve immediately. 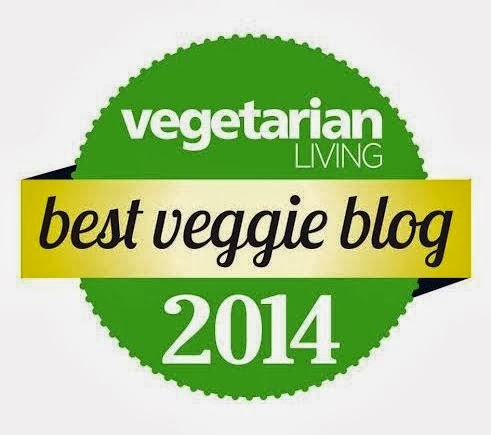 Those look yummy and easily veganized...Thanks! These tortillas are enticing, Mango. 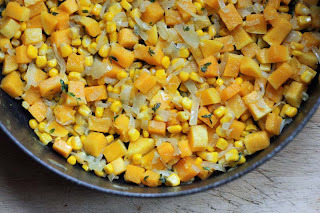 I love the combination of winter squash and gorgonzola. And your grill marks are perfect! I cheated a bit. I actually used my panini press. I must try vegan tortilla wraps soon! Oooh, these look delicious. Did you grow the squash? I wish I'd been clever enough to plant squashes last year...this year though. 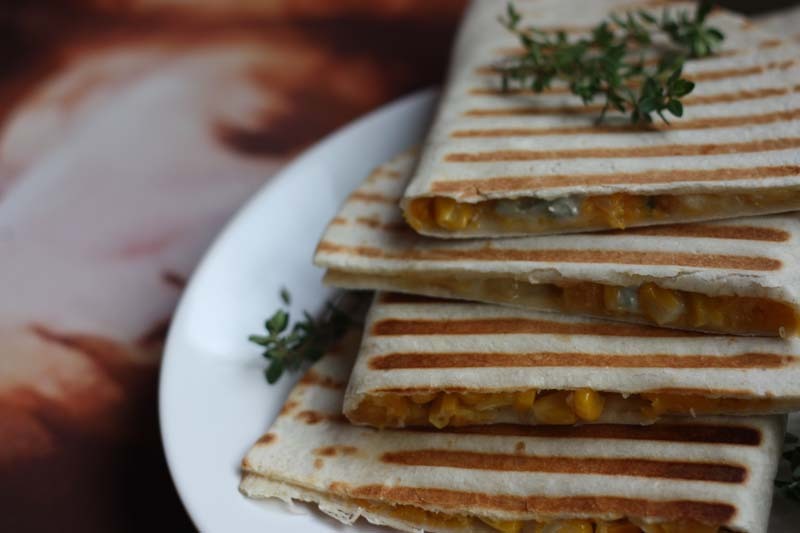 Butternut squash tortilla wraps! They look soooo good! Definitely something I have to try! wow...very healthy and delicious tortilla wraps...yum yum yum! Yes, I agree they were healthy, or felt it somewhat. Hi Mangocheeks; Do you make your own tortillas? You may have seen my post on this subject recently, and seen that I was not 100% successful. I need some advice: if you live in England, what brand/type of cornmeal would you use to make your own tortillas, and where would you buy it? These look really good. I doubt I'll add the blue cheese but the rest look great and I have happen to have several squash that I need to do something with. I'm always on the lookout for vegetarian dishes...and I've been particularly looking for recipes that use winter squash and pumpkin...this sounds and looks absolutely yummy! A unique combo that looks delicious! Yummy snack. The squash and corn is a neat combination. I will have to try this out. Sounds amazing! Will definitely try this. These look delicious. I might steal the recipe and use some feta that's lingering in the fridge. I find placing something heavy on top of the panini when it's on the grill pan helps melt the cheese and give the wraps those sought-after grill marks (in the absence of a panini press, which is now on my wish list!). Oooh, these look delicious! I love the combination of squash, blue cheese & thyme (it's my favourite homemade pizza topping). And it's a feast for the eyes as well as the tum, with such lovely colours on a dull january day! Oh I would have to see these when it's lunch time! I make something similar with mashed butternut squash mixed with a little cream cheese and then use in enchiladas. Would love to say Yes, but no not yet. 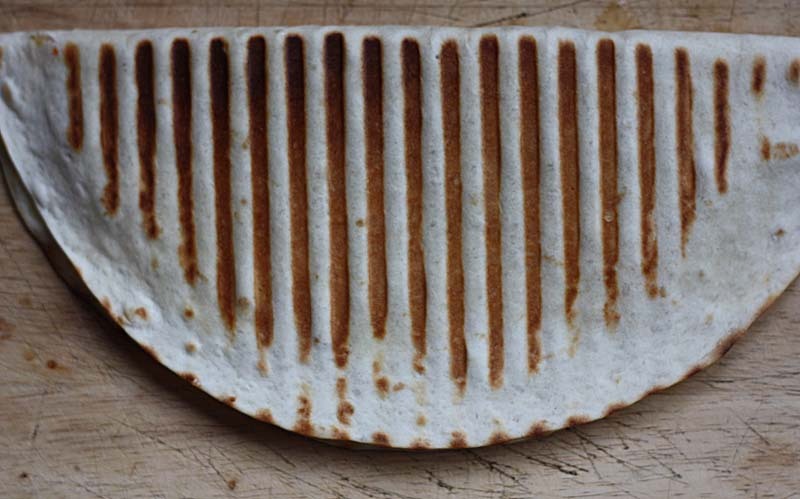 I had seena tortilla press once in B'ham at a bargain price and why I so regret not puchasing it now. So sorry cannot advise or shed any light. If you do get answers to your questions of brand, i'd love to know to for future reference. Hope you enjoy. 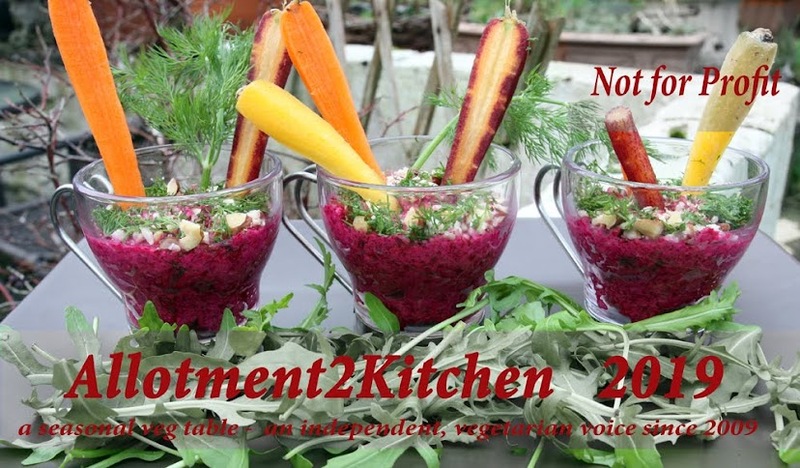 Its really a straight forward recipe. Thank you so much Cathy ak floweringmama. I do hope you enjoy the combo. Please please do, its really a straightforward recipe, esp. if you get read made tortillas. I think replacing the blue cheese with feta is great, I wish I had thought of that as feta is my preference over blue cheese. Also Thank you so much for sharing you tip. Really appreciated. I have an old fashioned iron that I use now and again as a tofu press to do a similar thing. Good luck on acquiring a panini press - I am sure the little fairy is reading your wish list. Ooh I had not thought about it as a pizza topping, now its a must try should I ever make pizza base from scratch! So true about the lifting colours for a dull january day! Liking the idea of cream cheese too. Super recipe, Mangocheeks. Made essentially as directed but using Laura's suggestion of using feta cheese. 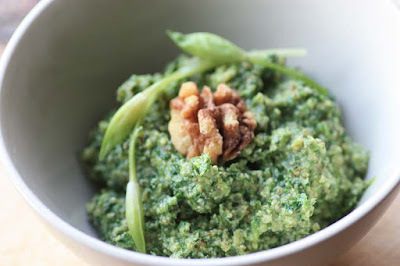 This is such a versatile recipe - I think I might next try a potato/pea filling with with a bit of cilantro. Sadly, no panini press in this house either, so I made do with a regular frying pan. Thank you again. I think if i was to make it again, I too would add feta as the blue cheese was a tad strong for me. I like your idea of potato and pea filling with coriander, I too may give that a go.